Well done to the tipping master for cashing in on his bet of 2015. 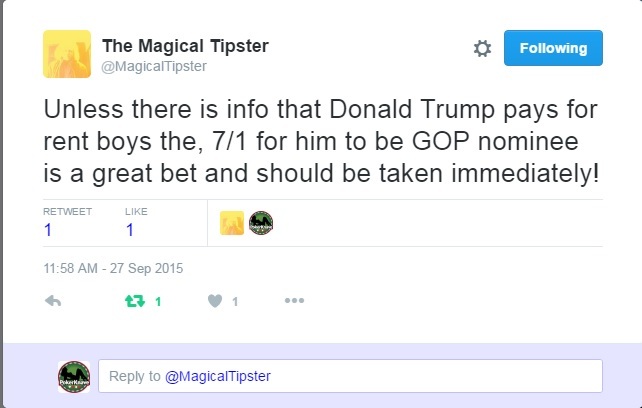 As you can see from the tweet The Magical Tipster made a big play for Donald Trump getting the nomination at a massive price, all things considered. Ha also made a great call on The UK voting for Brexit at 2/1 which ended up at 8/1! The Magical Tipster was the only tipster to have made this call and consequently the only one who got it right. Even Nigel Farage the leader of UKIP the anti- EU party thought Britain voted to remain. Clearly the last political tips that The Magical Tipster made were big and made up for the major losses he incurred during the 2015 General Election. So as we move forward it is cool to follow the man in the know and take on the elites who think they know what people think but clearly don’t. Remember The Magical Tipster has been around a bit and has seen them come and seen them go. PokerKnave's Blog betting, Donald Trump, GOP, politics, Republican, Republican party, The magical tipster, tips, tweet, twitter. permalink.